CRYPTOZOOLOGY ONLINE: Still on the Track: RICHARD FREEMAN: The Second Kasai Rex Photo! RICHARD FREEMAN: The Second Kasai Rex Photo! 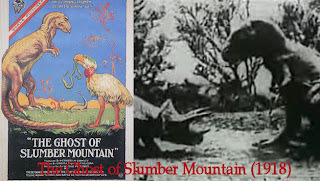 Most cryptozoologists are aware of the highly dubious story of a living dinosaur that appeared in the Rhodesia Herald in 1932. Swedish plantation owner JC Johnson claimed to have encountered a 43-foot Tyrannosaurus rex devouring a rhino in the swamps of the Kasai valley in the Congo. The story was accompanied by an unconvincing photo of what looked like a lizard, badly super-imposed onto a dead rhino. It showed a second purported Kasai photograph and this one showed not a lizard but a Tyrannosaurus rex. 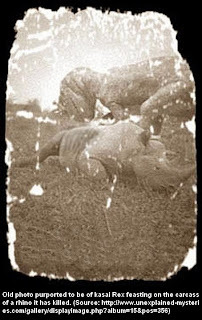 I know nothing about where the picture came from or how old it is but my guess is a modern fake in the style of the petranodon ‘thunderbird’ photo hoax of a few years back. The Tyrannosaur looks like it’s from some stop motion film. 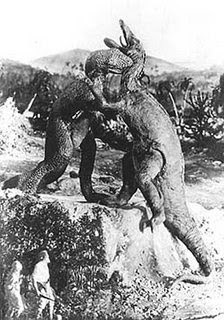 It could be Willis O’Brien’s 1918 movie The Ghost of Slumber Mountain in which a Tyrannosaurus kills and eats a Triceratops, or his 1925 offering The Lost World, which has both Allosaurus and a sequence with a Tyrannosaurs killing a triceratops and a Pteranodon. For my money, though, the creature in the photo looks most like the Tyrannosaur in Irving Yeaworth’s 1960 film Dinosaurus! where a living T-rex terrorises a Caribbean island. If anyone can identify where the monster in the photo comes from it will be me old mate Alan Frizwell, a true dino-movie freak. Over to you, Alan. You might want to actually check the link before having this posted for millions of web users. The damn link is broken. Hello?! I encountered that photo several years back on a cryptozoology site. I suspect that it was created by the same person that made the fake ropen photo. I can ask him about it.